Do you know a rising 12th grade student scientist with a great research project? Encourage them to apply for the 78th Regeneron Science Talent Search—top prize is $250,000! Application open now through November 14, 2018. The Regeneron Science Talent Search awards $3.1million annually to deserving high school students, and we want to make sure as many students, from all states and all walks of life, know about this opportunity as possible! The competition is completely free for students, and is a great indicator of top STEM talent—thirteen Nobel prize winners participated in this program as high school students. Would you be willing to share the message below to your audiences via email, on a blog, etc. to make sure they are aware of this opportunity? 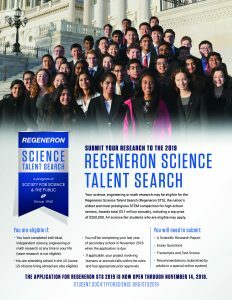 The Regeneron Science Talent Search 2019 application is now open! High school seniors across the United States are invited to share their original research projects and apply to the nation’s oldest and most prestigious STEM competition, where they could win up to $250,000. The top 300 scholars receive $2,000 each, and their schools also receive $2,000—that’s funding for STEM education in your community. Forty finalists will be invited to compete in the finals week competition in Washington, DC, all expenses paid. Every finalist receives at least $25,000 and if named in the top 10, could win between $40,000 and $250,000. Check out last year’s highlights video, learn more about the top 40 finalists’ research projects in this video from the Public Exhibition of Projects, watch the winner’s results and remarks from Malcolm Gladwell in this video from our awards gala to learn more. The application will close on Wednesday, November 14, 2018 at 8pm ET, but interested students are encouraged to open applications early in order to receive tips and reminders. There are no limits to the number of students who can enter from any school, region or state, and students may submit research from any year of high school. The program is free. Please email sts@societyforscience.org with any questions you may have about the application process.